I have altered my approach slightly to my free form designs. I pencil in the design first, as I usually do. Then I begin to paint in the areas subtended by the lines. If those areas, taken together, suggest a theme, I paint areas to further that idea and ignore the penciled-in lines. I noticed the bird right away and, as a sculptor does, revealed the person on which it was perched, by selectively painting areas that support that vision. I modify an area if a penciled line does not define it properly. 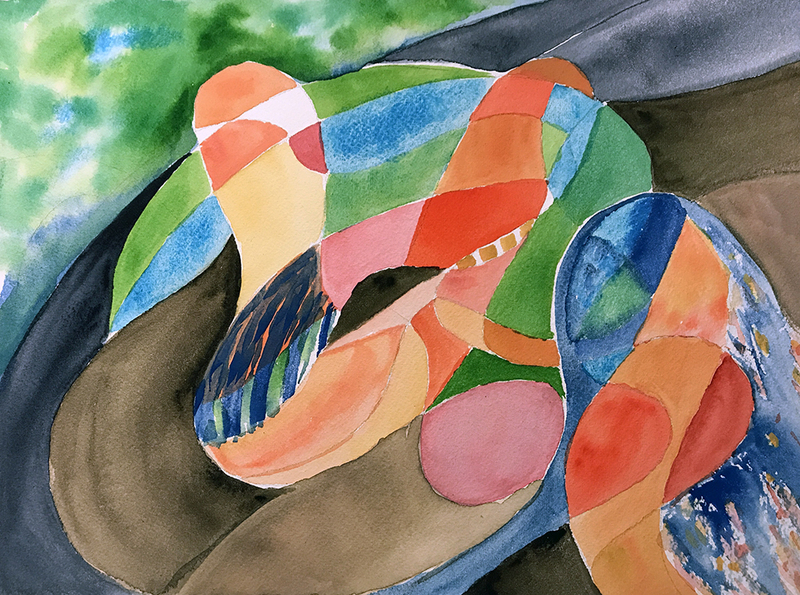 This entry was posted in Personal Stories and tagged abstract art, art, artistic process, creative process, creativity, free form, painting, technique modification, watercolor, watercolor technique. Bookmark the permalink.